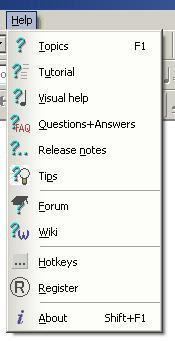 The help menu is the first place to look for information. Browse through topics, start using MusiCAD by using its tutorial, take a look at the visual help and click the item you want to know more about, skim the Frequently asked questions, keep an eye on release notes if you have been using MusiCAD before, have one more tips shown at program start. The MusiCAD forum and wiki can be reached from the help menu. When you'd like to register MusiCAD to disable the nuisance of the try-ware-restrictions select the circled R.
'About' will show you almost anything that is (more or less) relevant of your computer, Windows, your melody and MusiCAD.